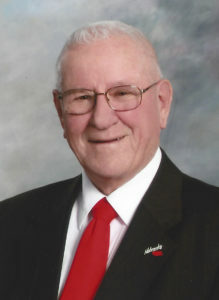 Monday, April 8, 2019 ~ 4:00 p.m.
Sunday, April 7, 2019 ~ 4:00 – 6:00 p.m.
Lee H. Sapp, 90 of Omaha passed away Saturday, March 30, 2019 at Oxbow Living Center in Ashland. He was born on a farm Southeast of Auburn, NE to Hurless and Emily (Hubka) Sapp. Lee graduated from Pawnee City High School before joining the U.S. Navy during the Korean War. He entered in 1948 and was honorably discharged in 1952. After the service Lee was united in marriage on October 25, 1953 to Helene Trenosky in Beatrice, NE. Lee was most noted for founding Sapp Bros. Inc with his three brothers. He was also involved with founding, Sapp Bros. Ford, Sapp Bros. GMC, Lee Sapp Leasing and Insurance, Lee’s Ford and Ashland State Bank. He was a member of the Masons, Shriners and was the NE Rotarian of the year in 2011. Lee had his heart set for higher education with support to the University of Nebraska colleges/campuses, Peru State College, Nebraska Christian College and individual scholarships to these institutions. He supported athletics at UNL, UNO and Peru State College. He was an avid Husker fan, but most of all he loved the state of Nebraska. Lee is survived by his son, Lee (Suzanne) Sapp of Ashland; grandsons, Brett and Conor Sapp; special friend, Ilma Gottula; sister, Zelma Drake; brother, William (Lucille) Sapp; sister-in-law, Rose Sapp; brother-in-law, Glen Barnard. He was preceded in death by his parents, Hurless and Emily Sapp; wife, Helene Sapp; daughter, Lori Sapp; sisters, Velora Barnard, Irene Brubaker; brothers, Ray Sapp, Dean Sapp; sisters-in-law, Lenora Sapp, Susie Sapp; brothers-in-law, Guy Brubaker, Kenny Drake. RIP in Uncle Lee…you will be missed. be with you all. Your Dad was a special man. Our hearts and prayers go out to all of the family. Lee was a mover and shaker who left a great legacy in Ashland. We have many fond memories of him. My sincere condolences to the Sapp Family upon the passing of Lee Sr.
As I reflect on Lee’s life, I owe him a debt of gratitude and appreciation for giving me a start in my banking journey at Ashland State Bank, over 40 years ago. My banking career and success stemmed from that initial opportunity at my home town bank. Lee was a smart business man, engaged in community and cared deeply for his staff. I am grateful for knowing him and being part of the Ashland State Bank team! God Bless you, Lee. Deepest Sympathy to you all,it was a pleasure to have visited with your dear family member. May our good and gracious God surround you with his loving embrace,and give you Peace. Sorry to learn of Lee’s passing…He always had a smile on his face & was a very generous man with the gifts the Good Lord blessed him with. Prayers to his family and friends. Only met Lee 3 or 4 times, but he left a great impression of a self made man coming from a family without much and with determination, hard work, retreating people with respect, and generosity rose to the position he did. From the perspective of a neighboring Ford Dealer, Lee Sapp was a gracious and honorable competitor, his word was his bond, his people were talented and of the highest integrity. Lee was a consummate supporter of higher education and extremely generous through his lifetime. I have good memories of Lee and his brothers. So sorry for your loss. To Lee Jr and his family. I send my sincere condolences for the loss of Lee Sr. I have known him for more than 20 years and know he will be missed by all. I enjoyed his sense of humor and his straight forward way of doing things, but most of all his honesty. My prayers are with you. To the entire Sapp family, my heart and prayers to out to you. So sorry for your loss. words can not express the sorrow in our heart for you both in the passing of your father. You will continue to be in our prayers. I leave the family with this quote. I am not sure if it was Lee or Bill or one of the other brothers but my parents and I were headed to see my sister in Omaha when our car broke down less than a mile from the coffee pot. We were towed to the truck stop where the care was repaired. My dad and his family lived across the road from the Sapp family, east of Filley. While the car was being fixed Dad visited. Dad tried to pay for the repairs but Mr. Sapp said “No, neighbors should always be neighbors!” I will never forget that quote and have used it many times since. Thanks for a life lesson. RIP to one of my oldest fellow Ford dealers I was a very young Ford Dealer when I first met Lee. I have remained friends and in touch with Lee Allen for almost as long as I have known his father. My deepest sympathies go out to Lee Allen and the rest of the family. I know he will be missed by all who knew him.